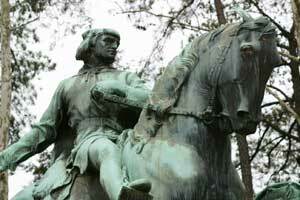 George Rogers Clark. Sculpted by Robert Ingersoll Aitken in 1921, located in Charlottesville, Virginia. 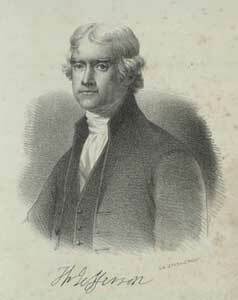 After the Revolutionary War, Thomas Jefferson was involved in at least four plans to explore the West. He initiated the first when he learned that several British citizens intended to investigate the country west of the Mississippi. In 1783, Jefferson, concerned that the British were eager to colonize the area, proposed that George Rogers Clark, the oldest brother of William Clark, lead an expedition. Clark thought the exploration would take four or five years and was unwilling to leave his business affairs for that length of time. He declined Jefferson’s offer, and the proposed mission never materialized. They [the French] give out that the object is merely for the improvement of our knowledge… Their loading and some other circumstances appear to me to indicate some other design; perhaps that of colonizing on the West coast of America, or perhaps to establish one or more factories there for the fur trade. John Ledyard. Wikipedia, PD-Art, PD-US. The next year Jefferson met John Ledyard who had sailed on the third and last voyage of Captain James Cook from 1776 to 1780 and therefore was perhaps the first American to see the Pacific Northwest. Ledyard gained Jefferson’s support for a one-man journey from Moscow to Washington by way of the Bering Sea. Jefferson obtained permission for Ledyard to cross Russia and enter the Pacific Northwest. When the Empress Catherine the Great changed her mind, he was arrested in Siberia and forced to leave the country. Thus ended Jefferson’s second attempt. take notice of the country you pass through, it’s general face, soil, river, mountains, it’s productions animal, vegetable, & mineral so far as they may be new to us & may also be useful; the latitude of places…; the names, numbers, & dwellings of the inhabitants, and such particularities as you can learn of them. Michaux was a scientist and seemed a good choice until Jefferson learned that he was a secret agent of revolutionary France. This information forced the termination of his journey when Michaux was in Kentucky. Thomas Jefferson. Lithograph by P. S. Duval after Gilbert Stuart. Courtesy of The Albert and Shirley Small Special Collections Library, University of Virginia Library. In 1801 Jefferson ordered a copy of the book entitled, Voyages from Montreal, on the River St. Lawrence, through the Continent of North America, to the Frozen and Pacific Oceans. Written about the exploration by Alexander Mackenzie and nine companions, the book made a number of things clear to Jefferson. First, Mackenzie indicated that his portage over a 3,000 foot mountain pass to cross from land draining to the Atlantic Ocean to land draining into the Pacific lasted only one day. He did not find a navigable river on the western side of the mountain range, but Jefferson and Meriwether Lewis knew that 400 miles south of Mackenzie’s crossing was the navigable Columbia River. If the mountains were as easy to cross near the Columbia as the area where Mackenzie portaged, the possibility of a waterway to the Pacific looked promising. Second, the book reconfirmed Jefferson’s fears about British colonization in the West. Several events converged after the turn of the century to make Jefferson’s fourth attempt to send an explorer to the West a successful venture. Most importantly, Jefferson was now President of the United States and had the power to implement his idea. He encouraged Congress to authorize and fund an expedition to promote trade with the Indians, explore the Missouri River, and search for the fabled Northwest Passage. Modern U.S. map with Louisiana purchase overlay by William Morris. Wikimedia CC BY-SA 4.0. Additionally, Jefferson had the good fortune of purchasing the Louisiana Territory from the French in 1803. Louisiana was at risk of being seized by the British if the French and British went to war. This was appealing neither to the French nor to Jefferson who did not want the powerful British to control New Orleans and gain the ability to strangle American trade flowing down the Mississippi. Jefferson instructed his American Legation in Paris to investigate the possibility of purchasing New Orleans. When the French offered all of Louisiana, the Americans were astounded. A treaty was quickly drawn up, and three separate copies were sent with three couriers on three different vessels back to the United States. The Corps of Discovery would be able to travel through United States territory rather than a foreign land.